Mr. Johnnie Stewart has been the Hanover-Horton High School gym/weight-training teacher for the past 18 years and counting. There has been an addition to the school and that is a new weight room. The school weight room has steadily been making minor improvements every single school year. It has added a surround sound music system, a whiteboard, and vending machine. 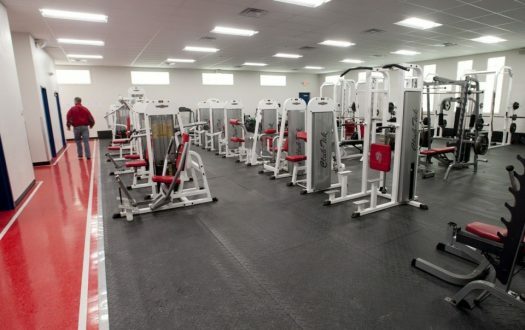 The students at Hanover-Horton are much pumped about the new additions and weight room. Scott Boden, a three sport H-H athlete loves the new weight room. With the new additions in the weight room students are wondering how to get big fast. Boden stated that he felt motivated with the new equipment and has more question about the Hanover-Horton weight room. Mr. Matt Resor is an Exercise and nutrition expert at the school. As the years go by the Hanover-Horton weight room will continue to get better. As a result more and more students should be motivated to work out more, resulting in a stronger student body. Stewart is very pumped about the addition, because he is also the head football coach and believes that it will help out the football program which has not had a very successful program in the past.